Note: This post may contain affiliate links. See our disclaimer for more details. Why is using a dog house a good idea? Most people tend to have the misconception that dog houses are meant for only those dog owners who intend to keep their dogs outside. However, the truth is that a dog house is always a good option, irrespective of whether your dog lives outdoors or indoors. There are a lot of benefits in buying the best dog houses. It provides dogs with shelter and keeps them protected from the outside weather. Dogs also get a space of their own that they can enjoy. If you opt for a portable dog house, you can take it with you on holidays to ensure that the pet does not feel irritable due to the change in environment. Dog houses tend to add beauty to the house and are a better option from an aesthetic point of view. You will find plenty of options available in terms of design and style, thereby ensuring that you have the opportunity to opt for something that suits your requirement and taste. Purchasing a dog house becomes necessary if you intend to keep the dog outdoors as it would need shelter against the various elements that it would find on the outside. If you do not provide it with this required shelter, you would be exposing it to quite a bit of danger. Keep in mind that your responsibility does not end with purchasing a dog house. 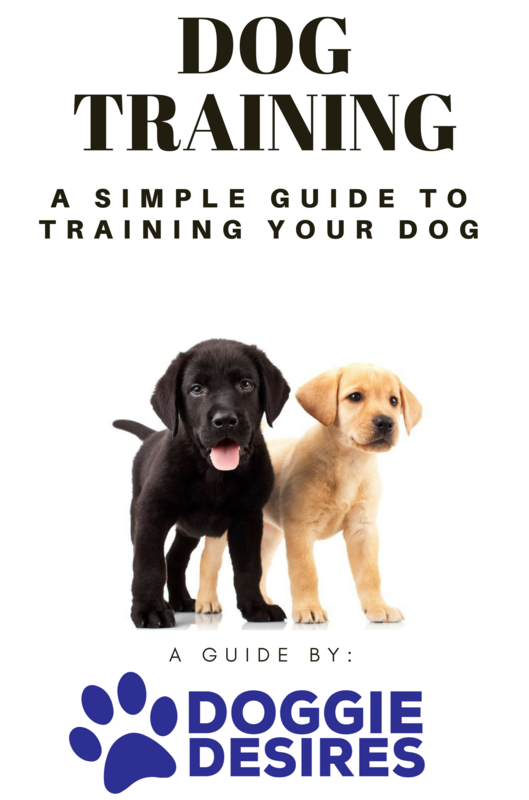 You will need to give the dog attention and interaction that it craves while ensuring that you bring it inside when the weather is particularly rough. It is not just for the outdoors that a dog house would be a good option. Dogs are habituated to build a den for themselves. This is why you often find your dog lounging under the desk or in a corner. Dogs like to have a space that is their own where they can acquire comfort and security. 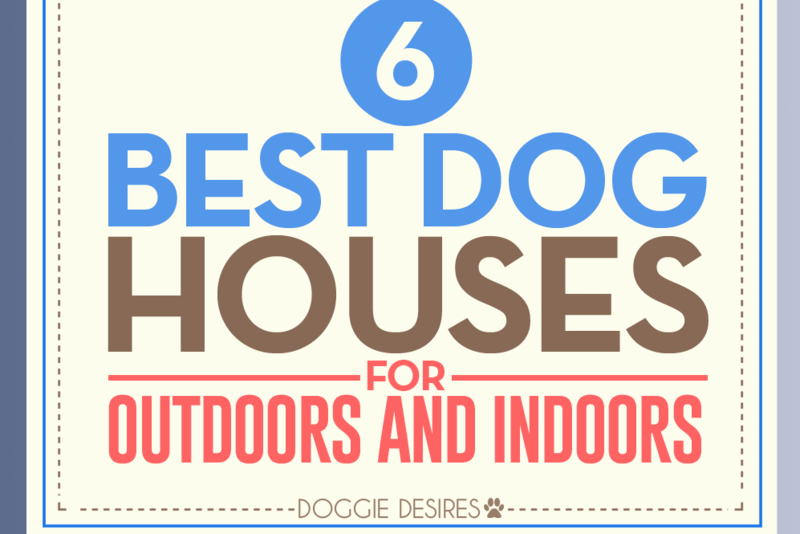 Thus, even if you keep your dog indoors, purchasing a dog house can solve a lot of problems. An outdoor dog house is constructed to ensure that it is able to provide shelter to your dog in all types of weather. It is sturdy and durable. It is also designed to withstand wind and rain. While appearance is something that you can focus on, you first need to ensure that the dog house can fulfill the requirements of your dog and provide it with a safe and solid home. An indoor house does not need to have the same level of sturdiness since it would not be required to protect the dog from the weather. People tend to prefer to opt for a dog house for the indoors that would gel well with the interior of their house. For indoor usage, the element of aesthetics is focused on more. Whether it is an outdoor or indoor dog house that you wish to acquire, there are certain factors that you ought to focus on to ensure that you get one of the best dog houses available on the market. Construction is among the first factors that you ought to pay heed to. You need to ensure that the dog house you purchase would be able to withstand the weight of your dog. If it is meant to be placed outside, it should also be able to withstand some rough conditions that it will be exposed to. You should take into account the type of weather your area has so that you can purchase the best dog houses accordingly. You should also ensure that the dog house is equipped with features that make it weather resistant so that the dog house has higher chances of lasting for a long time. The construction material of the dog house is important as well. Most people seem to prefer a wooden dog house due to the beauty that it has to offer. These dog houses are also found to be practical as they offer elements of weatherproofing and insulation. However, if waterproof dog houses are what you prefer, perhaps it is the plastic ones that would prove to be a better option for you. The appearance of the dog house is important as well. You will find plenty of options, and you should opt for something that would be suitable for your house. The size of the dog house is important as well since it needs to be of the size that is appropriate for your dog. Do not opt for something that your dog would outgrow within a short span if you intend to use the dog house for a long time. Now that we have discussed the characteristics that you should look for to get one of the best dog houses, we are going to take a look at some of the options available on the market. These are some of the amazing dog houses that have attained approval from quite a few dog owners. This is among the best dog houses that you will find on the market. It is manufactured from high-quality plastic that is extremely durable, thereby ensuring that your dog gets a comfortable and secure personal space. It is also provided with a large room and adequate volume, so you can be certain that optimal comfort would be provided to your dog. It is designed to withstand all types of weather conditions. You will find the dog house easy to assemble, and it would not take up a lot of your time. Give them a good life inside their amazing dog house…with BarkBox! If you are looking for a beautiful dog house for your puppy which you can place indoors as well as outdoors as per your convenience, this is one option that would not let you down. It is strong yet light in weight, thereby ensuring that moving it is easy. You will also be able to assemble it with a lot of ease. It is provided with an attractive design and a smooth surface that ensure that cleaning is not something that you would have trouble with. It is also provided with a durable construction with a raised floor design so that your puppy feels right at home. You will find it to be affordable as well. If you are looking for something different, this is one option that would prove to be ideal for you. This dog house has the feature of Microban, which means that it is capable of resisting the growth of odor-causing bacteria and other microorganisms. It is also provided with a roof vent that ensures continual air flow. It is quite easy to install, and you will not require any external assistance for the purpose. This is another great dog house that you will find on the market as it has a lot to offer. It is provided with a solid wood construction and is weatherproof as well. It has the feature of a slanted roof to give it a stylish look while ensuring optimal drainage. 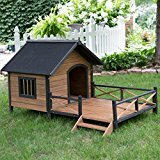 This dog house is suitable for both outdoor as well as indoor usage. It has a removable raised floor that ensures that you are able to clean it with ease. Attempts have been made to ensure that you are provided with optimal convenience. Detailed instructions are also provided and all the holes are predrilled to ensure that assembling is not difficult for you. Is your dog TOUGH? You need tougher toys. Check out Super Chewer BarkBox! This is another dog house which is suitable for both indoor and outdoor usage. This dog house is constructed using kiln-dried cedar and has been treated with natural color stains. 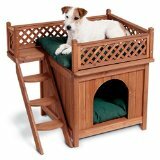 It is designed with side steps, balcony, and latticework to provide optimal comfort for your dog. It is highly durable and assembling it is easy. It would not take up a lot of your time and would get you a beautiful dog house within a short span. If budget is not an issue, this is a dog house that you would love to take a look at. Apt for the outdoors, this dog house is constructed from high-quality wood and has a solid feel to it. You will find it to be quite spacious. It is also equipped with a deck for your dog to enjoy. It is well insulated and can keep the rain out. All in all, you will find this dog house to be quite an appealing option if you are looking for an outdoor dog house.